The Imagined Land at Burnham Norton 2018 events have now been completed - here's a flavour of what we got up to! 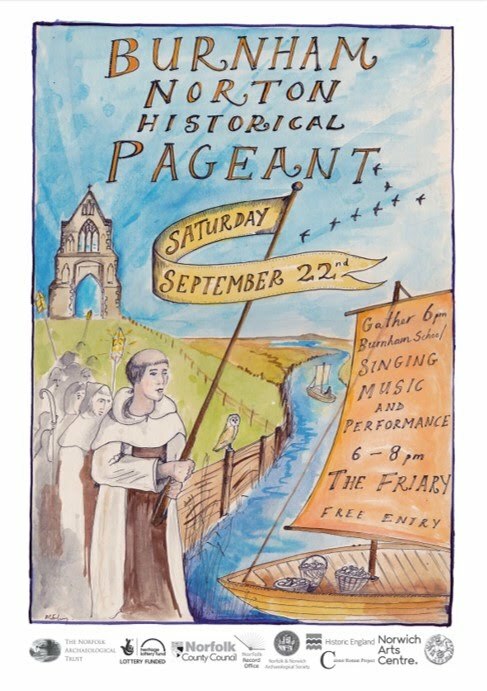 Burnham Norton Historical Pageant 2018! September is the month when all the activities and preparation came together with the final celebration: a through-the-ages lantern procession and historical pageant performed at the site on Saturday 22nd. BUILD – SING – SEW –PERFORM – SUPPORT! • Made costumes, props and decorations. • Built three large friars for the performance. Workshops ran every evening from Monday 17th - Friday 21st September 6.00pm -9.00pm at the school. These were 'drop-in' sessions and many local people came along and got involved with making lanterns, banners, costumes, singing, acting or just generally helping out! A celebration of 750 years of the Carmelite Friary in Burnham Norton with the Come and Sing Company and community choirs. Rehearsals were held all day on Saturday 8th September and Sunday 9th September , and Sunday 16 September with the concert from 7 pm on Sunday 17th. A series of workshops in school and community with local and project artists responding to the history we have found. See the finds, discover more with the researchers and project creatives. We encourage you to bring your photographs and memories of Burnham Norton and its surrounds. You are welcome anytime - no need to book. (although booking will be necessary). knowledge is necessary. Learning will be based on presentations and discussions led by subject specialists with some fieldwork. Further learning aids will be provided. The Friary was introduced into a well-established historic landscape and was a source of influence on the settlement pattern even after its dissolution. This event looks at the development of the Burnham landscape and its settlement history -- Saxon times, the Middle Ages, into the modern period. Everyone is welcome, whether they are going on the field trip in the afternoon or not. Dr Brendan Chester-Kadwell (landscape historian). This field-trip follows the morning study event; those wishing to come on this event should also register for the morning session. Visits will include the landscape of the North Norfolk Coast, the site of the Friary, St Margaret’s parish church and Burnham Market marketplace. The fieldwork will be led by Dr Brendan Chester-Kadwell; Jonathan Hooton; Dr Sally Francis (local historian). This event will explore interpretations of the site using a recent geophysical survey, archaeological excavations of other Carmelite sites, and historical sources. There will be an opportunity for discussion of the complex issue of interpretation. A guided tour of the friary site is included. FIELD TRIPS AND SITE VISITS may involve walking over rough ground and appropriate footwear and clothing will be essential. Lunches are not provided, although light refreshments will be available. If you are booking for whole day events, please bring a packed lunch (although food is available in Burnham Market). OPEN MEETING: was held 7 - 9 pm on Weds 15th November 2017 at Burnham Market Primary School.